This was our most satisfying furniture project till this date. A lot of people fix furniture and usually they all end up much better than they were. 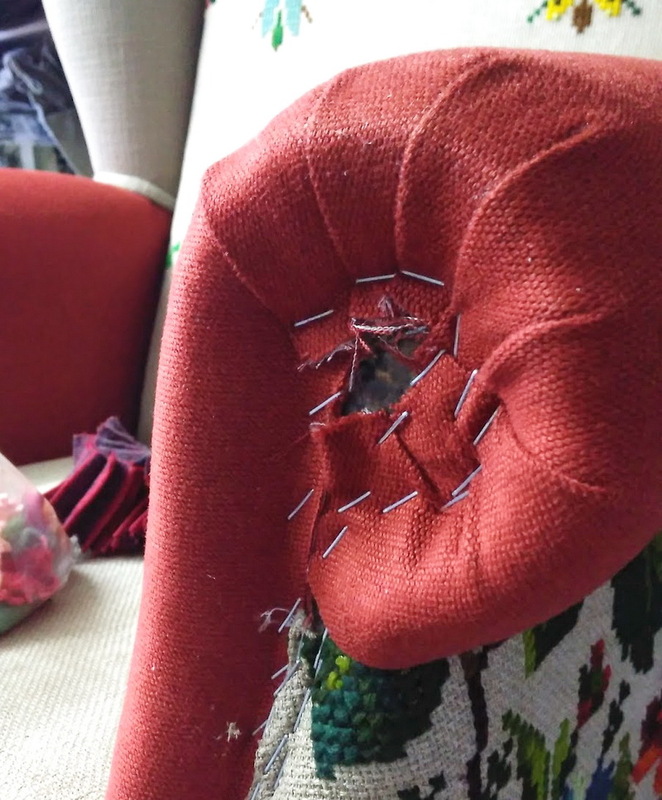 We also fix the furniture pieces but we also challenge ourselves to make them unique and unseen, something we also strive for with our jewelry, clothing, bags or shortly whatever we make. Our first idea was to make the same style chair we made before and sold recently. But pretty soon mum came with another embroidery pieces, a very large cross stitch embroidery done on linen with crocheted lace. I was a little disappointed as I had something totally different in mind, but went a long with the idea, eventually it turned out wonderful. At first we needed to figure out what we would use where, this is always a discussion that can take hours or even days, and plans keep changing along the way. Once we were sure it was time to cut the embroidery, always scary as such a gorgeous piece can not be found again and the fear of ruining it makes you extremely cautious. Of course the feet of the chair needed to be sanded, painted and varnished too, small things that you hardly see can take many hours. After cutting, most pieces needed fabric sewn on the sides, as the embroidery was limited we needed the extra fabric to be able to staple it on the wood. Also all fabrics needed to be serged for a long lasting piece. As we wanted to use the lace trim the embroidery needed also fabric below so that the lace could stay as it was. Some lace needed to be removed. All in all it was about 1 week of puzzling, cutting, sewing and serging. Mum dyed a whole bunch of vintage crocheted flowers in the colors of the embroidery. And then the time came to put all pieces together! Normally at the front of the arms are fabric covered wood pieces nailed on top to cover the staples. I had prepared those pieces with plain linen and the plan was to hand sew a few flowers on it. But we found it extremely plain and boring and it did not feel right. 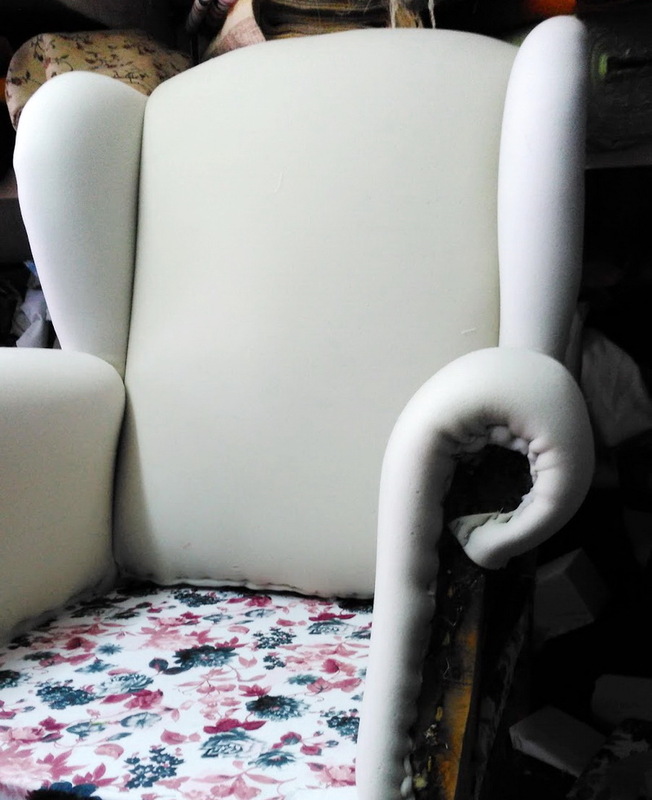 The idea to directly attach the flowers on the front with upholstery head nails crossed our minds and then we became all giggly and excited as that idea made the whole chair become really special. Of course no-symmetry was the mission, it is funny how asymmetry is harder to make than symmetry. 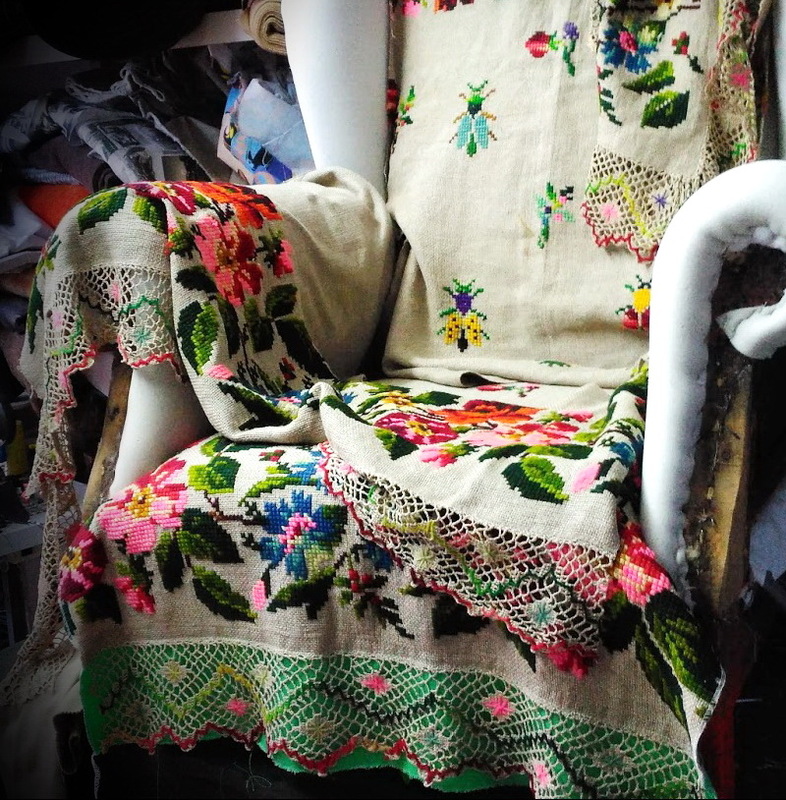 The embroidered flowers on the chair seem to come to life and bloom out of the arms! It also has cute bugs :) There were a few stains that did not go off with dry cleaning, mum covered those up with embroidery. Non of the embroidery was left, we used it all, only some of the lace was left. 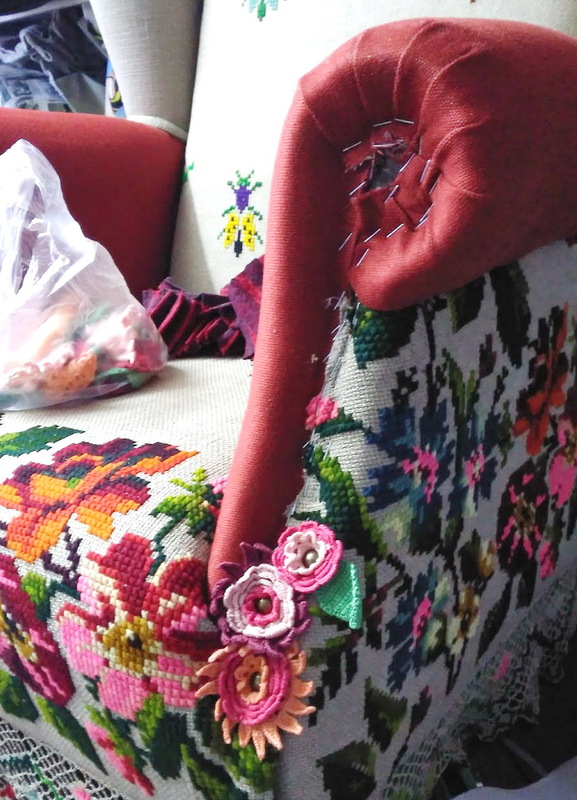 The piece of embroidery that was left we decided to use for a cushion which fills up your lower back or could also be used for a couch or other chair to fit with this armchair. The back side is an asymmetric patchwork with the 3 types of fabric used for the chair. This chair would look amazing in the middle of a room as all sides are beautiful you won't need to hide its back to a wall. Apologies if I was bragging too much but I am so happy how this turned out! The chair is available at StarHomeStudio where you can also see more pictures and read more info. 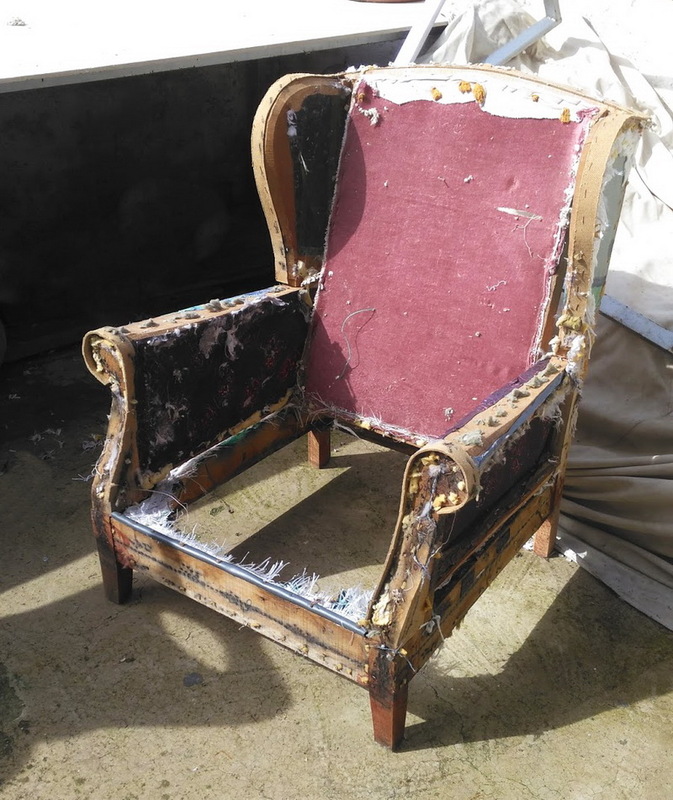 I'm totally impressed by how you made this chair! What a wonderful and unique piece! Love how you mix materials. The result is fabulous! it looks so fun now! Great work! Wow, just wow. I do not know what to say. It looks amazing. Gorgeous chair! Wonderful how your work gave it a new life. I love the bugs, and the attached flowers! Beautiful! I don't resonante with the asymetric part but the rest is just stunning! And I totally love the bugs emrboidery! Another amazing piece!Congrats! I don't think you can brag enough about this chair! It's absolutely fabulous!!! Love this armchair...just a gorgeous piece of furniture!